Discussion in 'Axe, Tomahawk, & Hatchet Forum' started by Smaug, Nov 8, 2018. The hammer on the other side of it is pitiful though; it's kind of roundish. Estwing has it all over them, in that department. I might have to grind it flat. The blade is narrower than Estwing, and the factory sharpening job is MUCH better. I was disappointed to get home and find out that the neat snap-on plastic cover is only supposed to be temporary. I got left out to dry, there. I may have some explanations for you. Excuse me if I'm stating the obvious - just trying to help. You are not supposed to hammer anything hard with the poll. That applies to most axes, as the poll is annealed, and not hardened. Many vintage axes have been abused in this fashion and it's a pity. As for the rounded corners, they will be more resilient, even when hardened. Or should I say "especially when hardened"? They won't chip when you hammer on metal (which, again, you shouldn't usually). All in all, rounded corners are a good idea. Remember how sharp turns are stress risers in knives? The modern designs are that....modern. As far as most are concerned here, overall, a nice vintage hatchet will (most of the time) run circles around these. 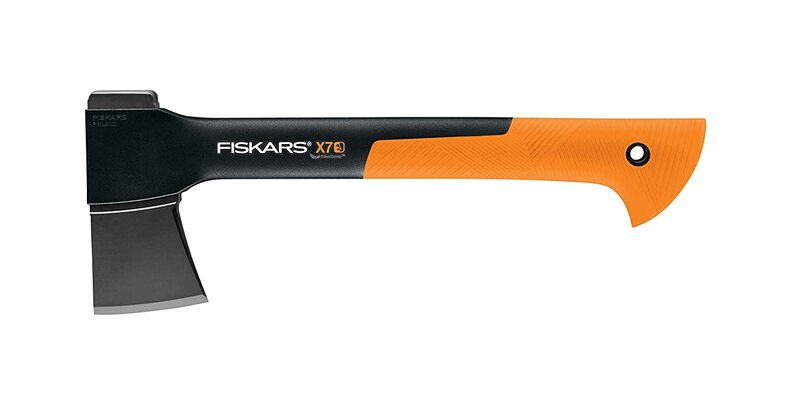 For example, Fiskars is great if the overall weight is a concern. They are newt, don't get me wrong, and a good choice for many, but not the first one necessarily. Good luck with your acquisition, and may it serve you well! Smaug and Square_peg like this. Use a piece of garden hose sliced longitudinally for a Makeshift edge mask. If you feel fancy, add some rubber bands as well . You can always go fancier, though! Smaug and rjdankert like this. And if you're a history buff, check out the granddaddies of this popular design: https://www.bladeforums.com/threads/finnish-earlier-scandi-axes-kirves.1428809/ . Rounded "everything" may look good, right? Why do you say "temporary". I got one of the larger, and the plastic sheat with the "latch" is definitely meant to be reused. They're not a bad hatchet and a great value. I agree with you about the advantageous weight distribution. It's a good choice if you want a small light hatchet for backpacking which is where mine sees use. And everything Moonw said is good advise. Smaug and Moonw like this. I thought the poll on hatchets is commonly used to pound in tent stakes, etc.? Thanks for taking the time to type out that informative post. Perfect! I was trying to think of something inexpensive, yet effective like that! The sheath you pictured is not the one I got. Mine is much simpler, probably to cut costs. I looked online at this hatchet, and where it is provided with the sheath you pictured above, it costs $10 more. I suspect they call it temporary because it has a "live hinge" that will eventually break, and they don't want to cover that with their warranty. Darn! If I had known that, is have probably gone with the Estwing and dedicated a bunch of time to sharpen it properly. Tent stakes are very mild steel. Pound on those to your heart's delight. Not my idea, read about it on the forum a while ago. I don't see myself ever owning one, but I always hear how well they fork as a small kindling maker. I'm willing to bet that if I didn't have the preferences I do and was gifted one of these I would probably have nothing bad to say about it, I certainly don't find these ugly in any way. I hope this serves you well.